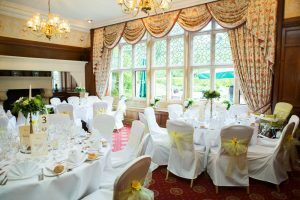 The Grim’s Dyke Hotel is perfectly suited for any size party, making it an ideal place for everything from baby showers and christenings to Bar/Bat Mitzvahs. Maybe you’re looking for somewhere to host your engagement party and wedding, or even an anniversary celebration or funeral gathering – with The Grim’s Dyke you’ll have a perfect 19th Century country house and 40 acres of scenery at your disposal. The Music Room has a capacity for gatherings of up to 120 standing (e.g. buffet), 88 (seated) or 60 if you’d prefer a dinner dance. Located on the first floor, The Music Room is complete with a Grand Piano, minstrel gallery and marble feature fireplace, creates a magical and memorable occasion for any event. (Please note, there is no lift access to The Music Room). The Drawing Room has a more intimate feel about it, making it ideal for smaller gatherings of up to 40 people (seated). The Drawing Room has oak wood panelled walls and the large windows offer a perfect view of the terrace and croquet lawn. (Please note, the restrooms are on the first floor of the main house and there is no lift access to them). Gilbert’s Restaurant can be booked exclusively for your use or you can enjoy your celebratory atmosphere with other diners. Exclusive use of Gilbert’s Restaurant is available between the hours of 1 – 5 pm on Saturdays and you’ll have a choice of afternoon tea, three-course lunch or a selection from our Private Dining menu. We pride ourselves on our flexibility and desire to make your event special and unique to you. We, therefore, have a selection of packages to suit every occasion and budget. Whether you’re looking for a formal six course dining experience, buffet and disco or afternoon cream tea, we can cater for your tastes and needs. If you’d like to make your party extra special, we have created some finishing touches that will indulge your guests and make your occasion that extra bit special. We have options for drinks on the terrace, pre-dinner cocktails and tray served canapés. Maybe you’d like to experience first-hand, a piece of British heritage? We have a choice of Gilbert & Sullivan operettas, a table magician, and a pianist to provide relaxing background music or even the amazing spectacle of Champagne Sabrage. We can even arrange to add floral centrepieces or candelabras for your tables, ensuring you have an event that is both glorious and memorable. Our experienced Conference and Banqueting team are available to answer your questions and make your event planning a lot easier for you. Why not give us a call and see how we can help make your event a truly memorable one? Call us on 020 8385 3103 or email functions@grimsdyke.com for up-to-date availability and price for your selected date.